The promised winter storm arrived right on schedule, and we got over a foot of snow between last night and noon today. Nevertheless, I’m going on the Sunday Scavenger Hunt. I’m just not going to leave the house to do it! This week’s search items were: The Weather Today, R is for…, Green, Joy, and Drink. Here we go! 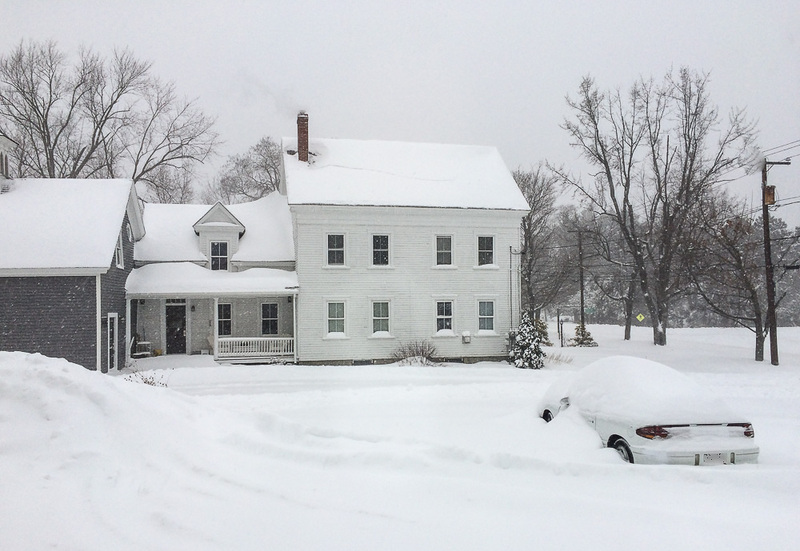 Today’s weather is…about 14 inches deep and 14 degrees Fahrenheit. This is not a black and white photo — it was just a black and white day. This was taken right after the snowplow guy did our driveway at 6:00 this morning. I’m not sure it helped much, and I’m truly grateful that I don’t have to go anyplace today! 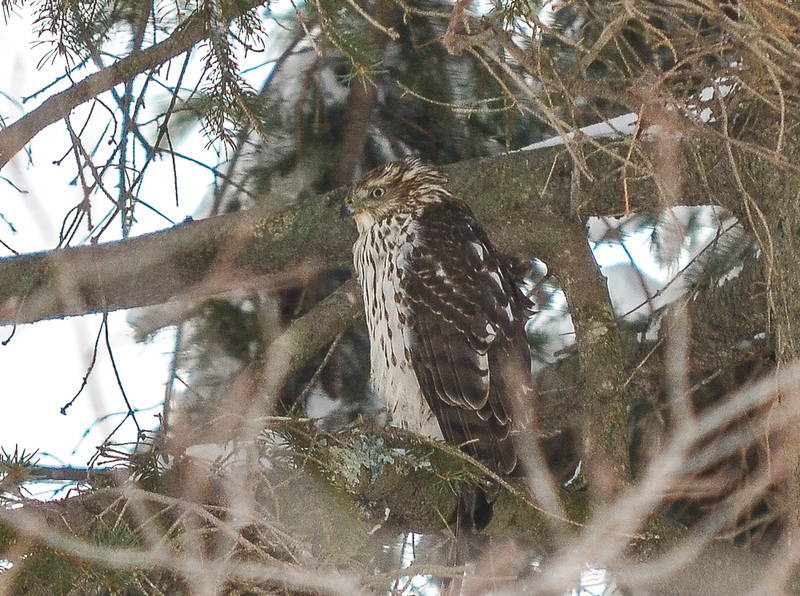 I believe this is a juvenile Cooper’s Hawk. He was perched in a pine in the back yard. Anyone who’s followed my blog for a while knows how I love my birds! I was really thrilled to see this one. 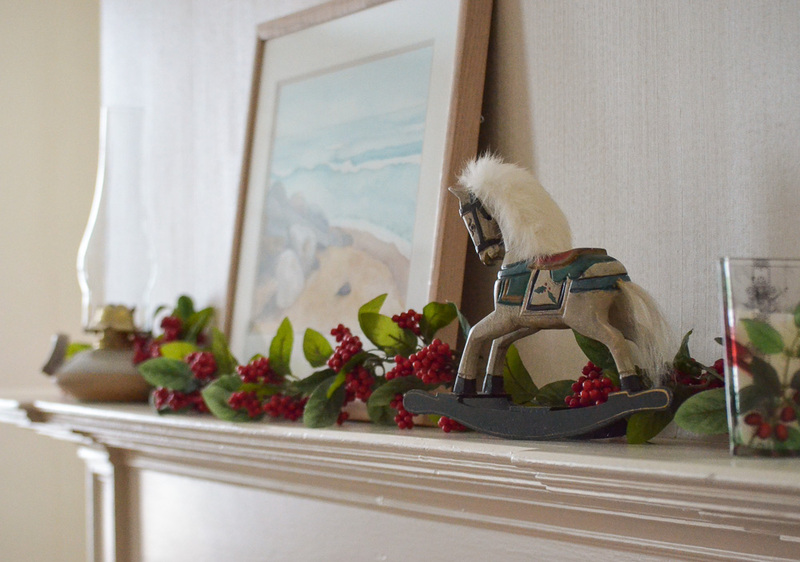 Christmas with its lights and colorful decorations is the perfect holiday for wintertime, especially on a day like this when the whole outdoor world is rendered in shades of black, white, and grey. Sometimes, even for a grownup, a toy can bring joy. The other day I was browsing through a large display of stuffed animals in a store, picking up this one and that, thinking of various people who might like one. Suddenly I spotted this one, the only one of its kind on display. It looks so much like a dear little dog I used to have that it felt like a gift from her own sweet self. 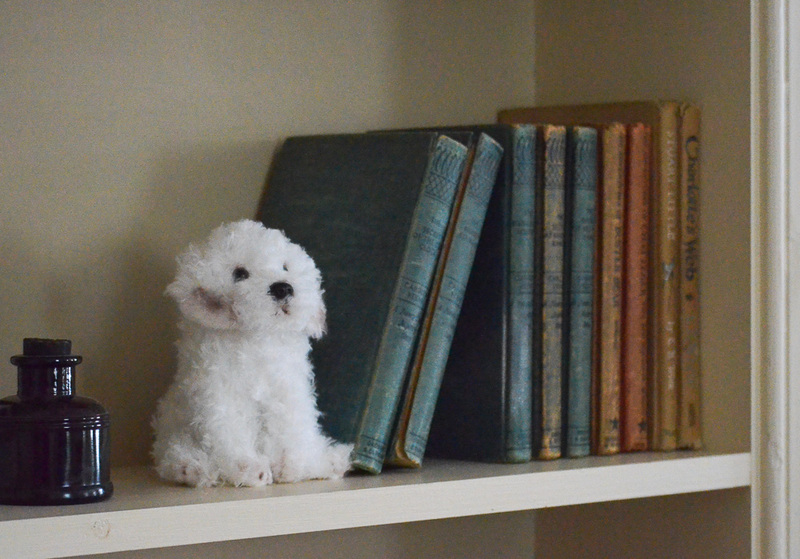 Now she sits on the shelf with my childhood books (we always got books for Christmas! ), and I smile every time I see her. Tea is soothing, warming, comforting, even healing. 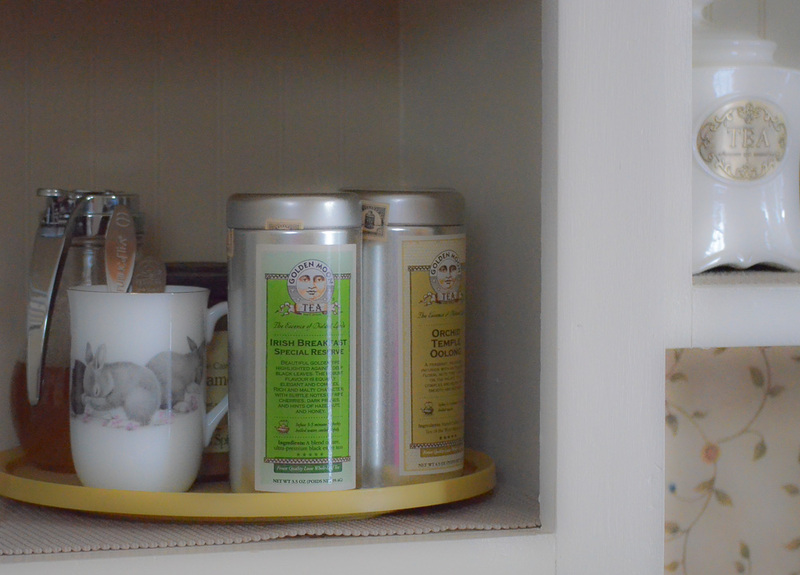 I love tea and always keep the makings close at hand. That’s a wrap for this week. Have you tried Scavenger Hunt Sunday yet? It’s fun! Here’s the linkup for this week. Categories: Scavenger Hunt | Tags: books, Christmas decorations, cooper's hawk, New England, snow, tea | Permalink. I knew when I took this photo in early February that it would be my choice for this month’s Photo-Heart Connection, and I’ve been saving it to share today. Isn’t he (or she) magnificent? To give you an idea of scale, the bird bath is 18 inches across and is only 15 feet from my front door. I was at my desk when I glanced up and saw him. I slowly and carefully reached for my camera and took half a dozen quick shots as he lingered there. The blurs in the foreground are caused by the top of a garden gate that’s adjacent to the window. I knew he could see me through the window and was afraid if I stood up for a clearer shot that he would fly away — and that’s exactly what happened when I tried it. I’m glad I took my “insurance shots” first. 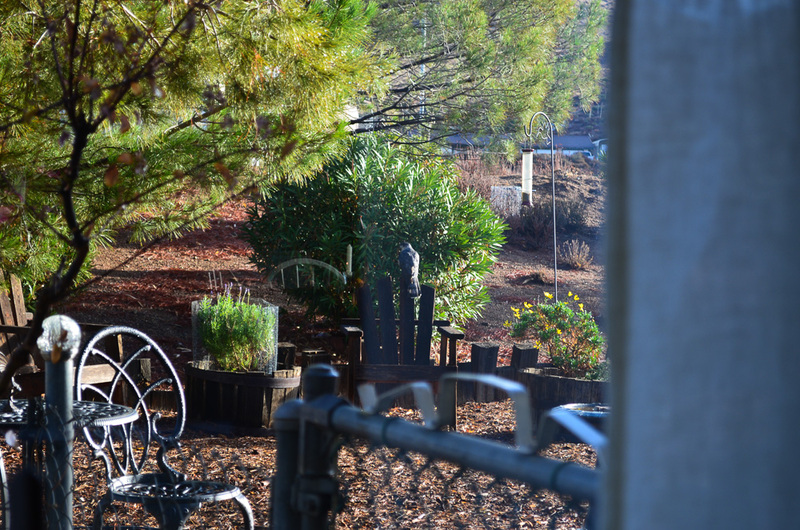 If you’ve been reading my blog for any length of time, you know that I love the whole variety of birds and other creatures that inhabit this space with us. Their voices and antics entertain and delight me every single day. But hawks — like wolves — epitomize wildness to me. 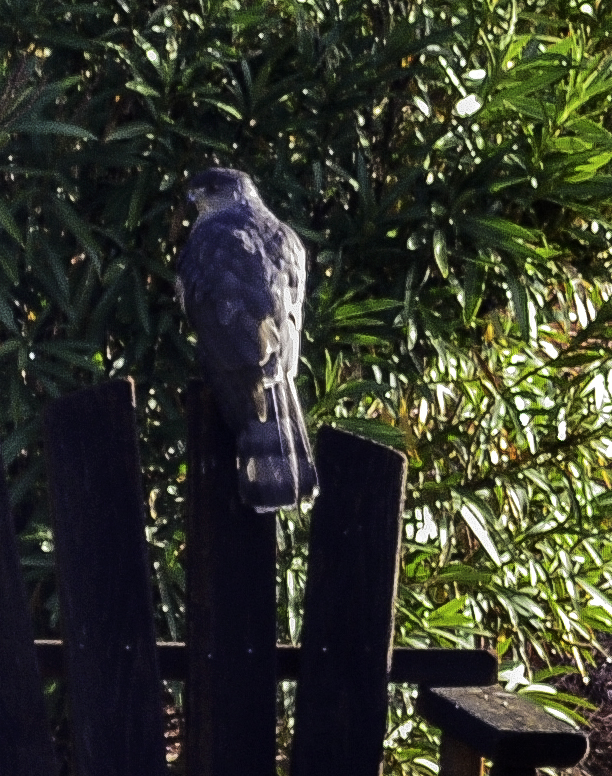 There is something so incongruous about this huge, beautiful wild thing perching on my little domestic bird bath! I can’t put into words the feeling it gives me, like something is going to explode in my chest. Perhaps he stirs a secret wildness in my own heart. I watch in astonishment and awe, honored that he would stop by my tiny oasis in the desert. Welcome, welcome, my friend. Come back any time! Linking to Kat Sloma’s Photo-Heart Connection for February. 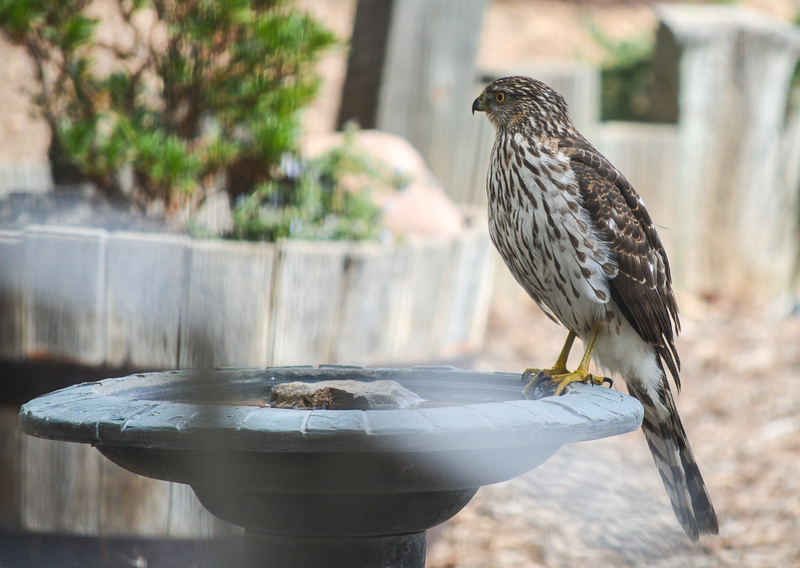 Categories: Photo-Heart Connection | Tags: Acton, bird bath, California, cooper's hawk | Permalink. Last month, Exploring With a Camera was about using blur creatively when taking photographs. This month, Artistic Blur Part 2 is about adding blur to images during post-processing. I don’t normally do a lot of “creative” or special effects post-processing. I’m more focused (pardon the pun) on capturing what I see and getting my photos to be sharp. Why would I want to mess them up by making them blurry in post-processing? Then I saw a couple of other people’s responses to this prompt and it looked like they were having fun, so I thought I might try it. I pulled a few images from my archives and started to play. This is an onion that had bloomed and gone to seed in the garden. 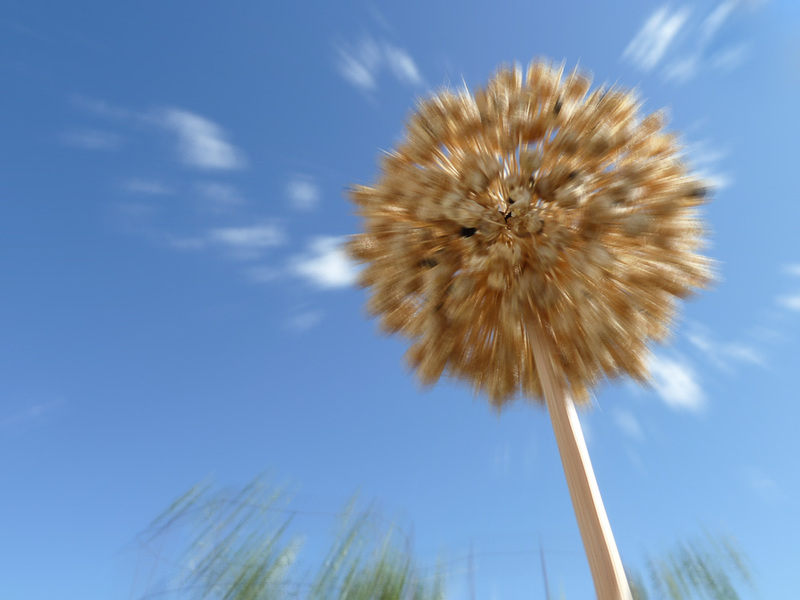 I used Photoshop Elements to add a Radial Blur filter with a zoom effect. This blur was added in Lightroom. 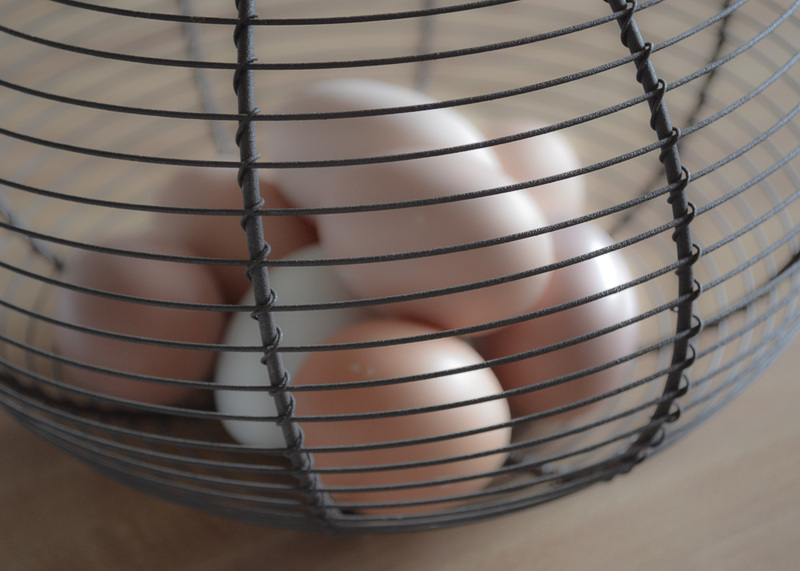 In the original photo, the basket was sharp while the eggs were out of focus. I moved the clarity slider to the left (minus 71) and decreased the vibrance and saturation, which gave the image a soft overall glow that I liked. 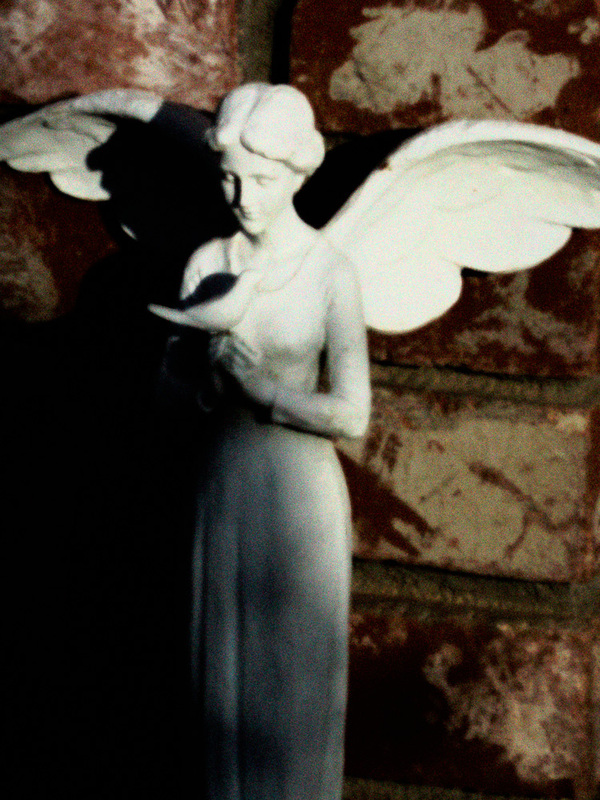 In PSE I added a layer of Gaussian blur to this little angel using the Linear Light blend mode. Then I added a filter layer of enlarged grain. 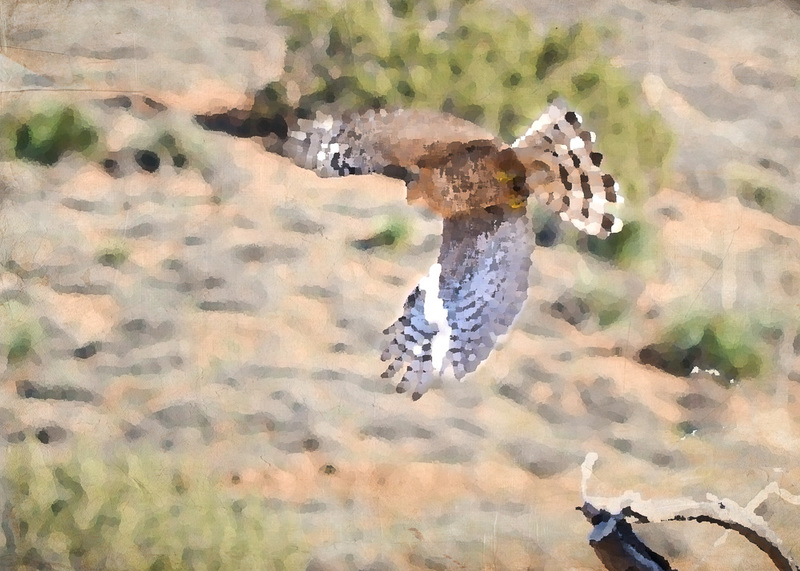 In this image, the background was already somewhat blurred due to the depth of field, but the bird was sharp. I tried several different effects and decided I liked this one best. I added a texture layer (Empty Page, a free texture from the lovely Kim Klassen) and then added a Palette Knife filter. I’m not completely satisfied yet and may try some other things with this one. I really enjoyed this exploration. I’ve already got a few more images in mind that I’d like to try some of these techniques with. Thank you, Kat, for all of the fascinating aspects of photography you’ve introduced me to through Exploring With a Camera. 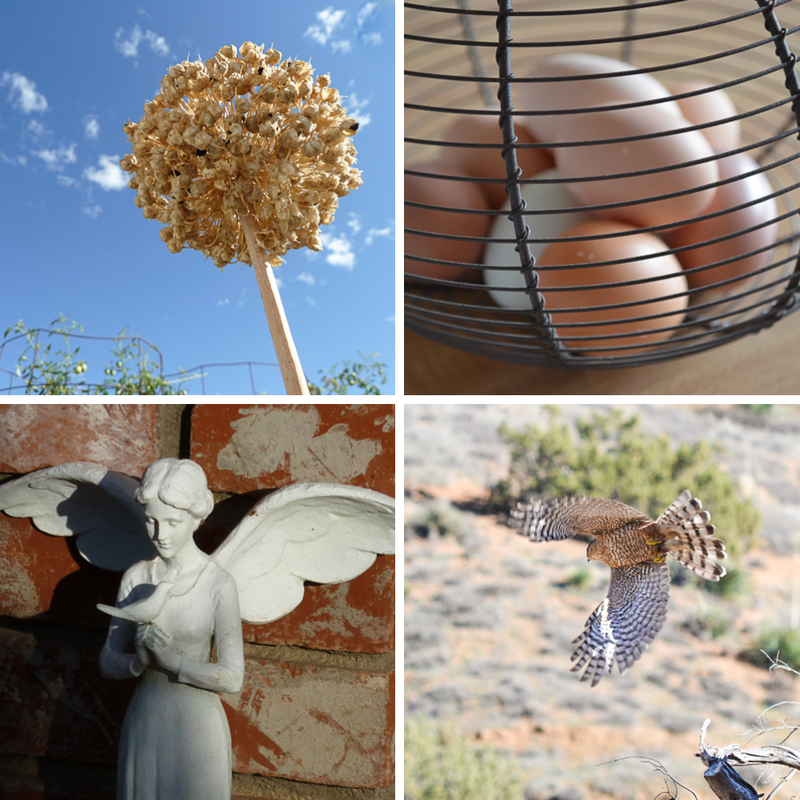 Categories: Processing | Tags: angel, basket, blur, cooper's hawk, eggs, Exploring With A Camera, onion seed head, processing | Permalink.